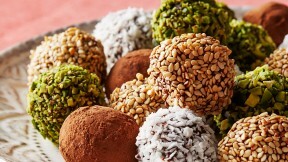 This date truffles recipe appears in the "Dates" episode of Martha Stewart's Cooking School. Combine almond flour, powdered milk, and spices in a small skillet and place over low heat. Cook, stirring constantly, until mixture is fragrant and light brown in color, about 2 minutes. Add butter and stir until the butter is melted and mixture is well combined. Transfer to the bowl of an electric mixer and let cool, at least 5 minutes. Add date paste, cocoa, and salt to bowl and beat until well combined using the paddle attachment. Scoop balls using a tablespoon or a small ice-cream scoop and drop onto a parchment-lined baking sheet. Roll between damp hands to smooth. Refrigerate truffles at least 1 hour and up to overnight. Melt chocolate in a heatproof bowl set over a pan of simmering water, stirring until smooth; stir in coconut oil. Dip truffles into chocolate, scraping along the edge of the bowl to remove any excess chocolate. Roll to coat in pistachios, coconut, or sesame seeds, or a mixture of sugar, 1/4 teaspoon cinnamon, and 1/2 cup cocoa powder.